Our researchers have classified PaceItUp as an adware infection that poses a significant threat to your system’s security. It is recommended that you remove this seemingly innocent-looking application in order to ward off any potential security threats. The app has been deemed a threat, because it displays unreliable commercial advertisements that might be brought to you by various shady businesses. PaceItUp could show misleading or fake advertisements of various websites and gather personally identifiable information about the infected computer’s user. Therefore, we have composed a guide that will help you remove this infection manually. 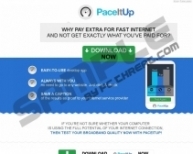 PaceItUp is advertised as broadband quality tester that is claimed to show the exact speed of your Internet. However, research has shown that the program is only partially functional, meaning that the results are not objective, because not all variables are being tested. Therefore, this application is unreliable, since it cannot adequately perform the functions it ought to perform. So, we recommend that users remove this application at their earliest convenience. But, nevertheless, we still have more information about this app. This infection has been classified as adware, because it displays commercial advertisements that can only be regarded as unreliable. PaceItUp could be used by dishonest advertisers to promote misleading or fake content. Consequently, you might get redirected to an infected website and get your computer infected with malicious applications if you were to download anything. Note that the infections could range from easy to remove adware to very difficult to remove ransomware. So, if your computer gets infected with ransomeware, manual removal would not be an option. To get rid of it you will need an anti-malware scanner such as SpyHunter. In any case it would be best to remove PaceItUp before any other uninvited infection start to wreak havoc on your computer. This program, belongs to a family of clones that include: Speedcheckme, SpeedChecke, TestSpeeder and Ineedspeed, among others. 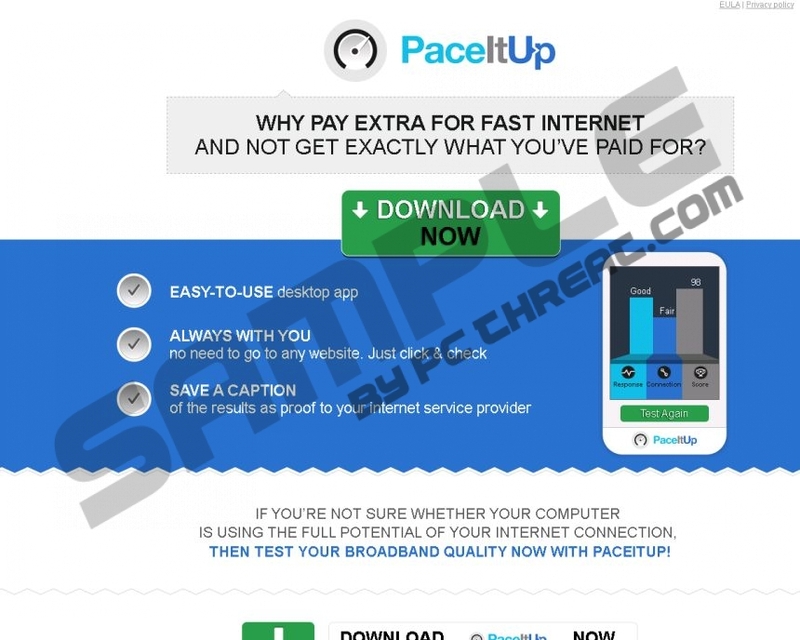 In addition, PaceItUp has its own website at Paceitup.co, but the download button does not work. So, this infection can only be distributed via freeware bundles found on websites such as Softpedia.com, Brothersoft.com, and so on. As you can see, this application is not as useful as its advertising claims it to be. In fact, the program is merely an infection that you should remove, because it poses a significant threat to your system’s security. Your computer could be infected with malicious applications, which will be very difficult to root out. So, once again we advise you to remove this infection. Quick & tested solution for PaceItUp removal.